Sony Camcorders have long been viewed as leaders in the field, and Sony's current crop of models offers options for movie makers on many different budgets. Sony offers compact designs and an interesting range of features, including their NightShot technology, which allows for filming in total darkness. On this page you can view ratings, features, and prices of the Sony camcorder line. The right side of the DCR-DVD100 is predominantly taken up by the DVD storage area. 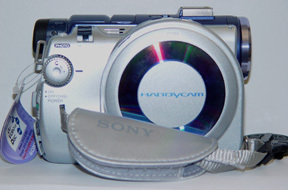 The DVD door is a circle of gray, with a blue mirrored band, with a center-circle emblazoned with the trademark 'handycam' logo. A nylon Sony strap covers the base of the right side. 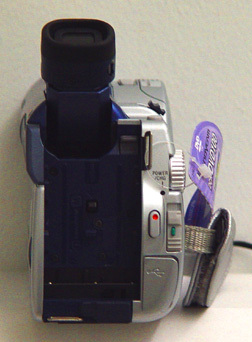 To the left of the strap is a nubbed, locking, dial that changes camcorder functionality from playback, to video, to stills. Above that dial, is the zoom control, which is raised, and offers adequate resistance for a precise journey from telephoto to widescreen. To the left of the zoom control, is the depressible electronic shutter for snapping stills. An interesting element of the DCR-DVD100 camcorder, is that unlike many camcorders on the market, one can not snap a still in video mode. On the top of the back of the DCR-DVD100, is a pull out color viewfinder that lifts from to a 55 degree angle. The eye piece is surrounded by a thin black rubber mold, which is doesn't cut the mustard for those who wear glasses. The image displayed in the viewfinder fits the entire space, and doesn't feel as though it were far away. Below the viewfinder is the lithium battery port, and underneath that is the AC cable port. Diagonally across to the right, is a USB output and a jack for a remote control cable. Above those ports, the sliding power button and the protruding record button sit side by side. The left side of the DCR-DVD100 has all the action. The 2.5 inch LCD, and majority of the manual controls are located on this panel. The 2.5 inch LCD Monitor has 123,000 pixels of resolution. Above the LCD are five playback buttons. These include two track skip buttons, one for jumping forward on the DVD, and the other for jumping back. Frame by frame tracking is controlled with the remote. Above the playback controls, are a backlight enhancement button, a fader, and review button-that returns to the first sequence on the DVD. On the front end, of the left side, are manual controls for focus and exposure. Both are engage by depressing the corresponding button, and making adjustments with a tiny recessed dial. While this isn't the best way to control the features, it's better that not having them at all. A redeeming element of the manual control, is that picture adjustments can be made from the point of optimal processor recognition-you can tweak the default processor image. Unlocking the LCD reveals another set of controls, and dime-sized Dolby digital speaker. Configured in a circle of left, right, up and down buttons, with an enter button in the center are the menu controls. Above the menu functions, are a visual index and setup feature. The latter controls the library of footage and stills. Both are displayed in file format, with the first frame of each piece of footage as a visual reference. The 'setup' is a misleading reference to menu access. In the menu, a series of applications and controls can be manipulated. Highlights include the finalize function, that readies the DVD for playback on DVD players or on DVD Rom, a wide screen format option, and HiFi sound playback. The top of the DCR-DVD100 has a few functions and a hot-shoe for Sony accessories. In the center of the camcorder, just beyond the viewfinder, is a switch for the covert ops favorite-Nightshot feature. To the left of that is a super slow shutter for low light scenarios. In front of those low light controls, is the camcorder's hot-shoe. The Sony DCR-DVD100 provides the processor power to achieve the level of automated picture quality associated with Sony. This is a great point and shoot camcorder. In all manner of lighting the automated picture is good. While this is by no means a professional grade camcorder, for what it is, the DCR-DVD100 has the ability to take good footage in automatic mode. The DCR-DVD100 has average manual control functions. Sony made the correct decision to take these out of the LCD menu and put them on the camcorder, but they didn't create a user friendly system. The focus and exposure are controlled by a tiny recessed dial. Why designers opted out of a focus ring, or even a larger, better placed dial, is baffling. Users have the ability to adjust many facets of an image, but there is no way to tweak the shutter speed, other than a switch on top of the camcorder that sets it to super slow. White balance is controlled from within the LCD menu. Also worth mentioning are the series of standard Sony presets, like sun/snow, spotlight, portrait, etc. 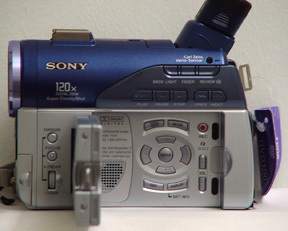 The 10x optical zoom of the DCR-DVD100, is controlled by a raised toggle-type switch on the right of the camcorder. The component enables adept, smooth and variable speed zooms. The Sony DCR-DVD100 is best used in auto focus. The processor is fast, and transitions to the principal subject in the optimal focal length quickly. Keep in mind this is a point and shoot camcorder. If you want to create artful shots, with focal adjustments, buy a camcorder with a focus ring. Controlling manual focus with the recessed dial is clumsy at best. The DCR-DVD100 has manual exposure controlled with the same recessed dial as the manual focus. The processor generally provides more than adequate image quality, and the fact that you can tweak that to your needs is another positive attribute of the camcorder. Unfortunately, the controlling mechanism is on the small side and the location leaves something to be desired. The camcorder quickly adjusts to its environment. Moving from indoor conditions to outdoor was nearly seamless. Imagine following your little ones from the house, to the back porch for a game of catch, with little bleaching due to sudden sunlight. There are a slew of presets in the LCD menu that can further enhance the processors ability to provide an optimal image in diverse conditions. The DCR-DVD200 has no manual shutter speed control. Like most consumer camcorders, the DCR-DVD1000 has the standard white balance options: auto, manual, indoor and outdoor. The auto mode worked quite nicely, and having the option to adjust white balance as needed, was a welcome addition to the camcorders' functionality. There is no manual gain control on the point and shoot, DCR-DVD100. One word describes the still performance of the DCR-DVD100-bummer. The maximum pixel resolution of stills is only 640 x 480. While the more expensive models in the line have a more reasonable 1,152 x 864 pixels, the count is far below 2,016 x 1,512 of the recently reviewed Sony DCR-PC330 or the Panasonic PV-DV953's 2,048 x 1,496. Another drawback is that you can't shoot still while in video mode. The DCR-DVD100's VCR mode should be titled DVD mode, as that's the difference, no tape, just silicone. Playback works well, with convenient and easily operated search functions that skip from track to track on the disc. In addition, frame by frame tracking is available through the remote control. Now the beauty of the machine; finalize the disc then pop it into grandma's DVD player and you've got instant family fun. Or drop the removable media into your DVD Rom and you're ready to import edit, email, and post all of your MPEG-2 video with HiFi sound. One note, software technology is moving so quickly, that the standard video compression in now MPEG-4 (commercial DVD quality), two generations ahead of the DCR-DVD100. The dynamic range of the DCR-DVD100 is better than fair. There's grain, but the colors produced are distinct. Indoors with adequate lighting, the camcorder preformed on par with larger CCD units. Deliberately dropping the levels, using one 60w bulb in an otherwise dark room didn't make too much of a difference, the picture still looked decent. Although the automatic focus feature suffered, and image tweaking with the manual exposure dial was needed. Overall, the DCR-DVD100 has surprisingly good low light performance. The DCR-DVD100 has a small 2.5 inch LCD Monitor with 123,000 pixels of resolution. It would be nice to have a 3.5 inch LCD on such a boxy camcorder. The LCD delivers a crisp, clean image, and the menu for function navigation is well laid out and easy to access. Font size is a feature, so you can kick it up a notch, if the bifocals are a bother. The eye piece has a thin, hard-rubber boarder that makes use difficult for those who wear glasses. Although the DCR-DVD100 doesn't allow manual setting or monitor of audio levels, the device has HiFi Dolby Digital playback. The microphone on the DCR-DVD100 is inadequate, but a built in hot shoe is a great spot for a directional microphone accessory. There's really not much more to say about audio on the unit, Sony's left manual audio control off the table, so we've got to rely on their HiFi Dolby claims. The DCR-DVD100 is well organized for the amount of external controls, but the unit feels slightly unbalanced and looks like a box. The relevant manual controls are easily accessed, but better placement for exposure and a manual focus ring would be appreciated. When resting firmly in hand, the unit drifts to the left. This is a direct result of packing every feature on the opposite side of the DVD. The best way to steady this sucka, is with an up turned palm on the underside of the unit. Unlike the majority of Sony's, that have classy suede straps, this model has a nylon swath. That strip of nylon doesn't provide the feeling of security or comfort of the suede, and with the weight balance issues that's a significant drawback. While admittedly it is a difficult design problem, as DVD's and the housing mechanism weigh mere ounces, and the weighty LCD, lens casing, and the slew of features are situated on the other side of the unit. Perhaps the designers at Sony should develop heavier DVD's, or, they could try to make the LCD lighter. The DCR-DVD100 is missing a few ports and jacks, compared to most high-end camcorders. While it does include USB, AC, AV, SVideo In/Out, and a hot shoe, the camcorder is missing a Firewire port (it capture to DVD), and an external headphone jack. The port placement is fair, although sticking the AV and SVideo directly underneath the lens could present problems if you're using and external monitor during a shoot. Although, chances are slim that a Pro will use this camcorder for anything but pickup shots. . In comparison to the majority of camcorders review by camcorderinfo.com, the DCR-DVD100 is an other feature. The DVD capabilities are cool, and the camcorder captures a fairly good image. Yes, there is a widescreen option, the control for which is located within the LCD menu. While there's no software included for webcam capabilities, an included USB should enable one to use the camcorder as a webcam. Unfortunately DCR-DVD100 is two generation behind the current MPEG-4 standard, the DVD100 can only capture MPEG-2 quality video. The DCR-DVD100 can transfer an analog signal from a VCR or television to a DVD, and can directly duplicate that content if your PC can burn video. This is an optimal camcorder for the point and shoot set-although you'll probably want to step up to the DVD200 or DVD300 models for better still capabilities and a large CCD. The technology is still on the high-end of the price scale-for what you get. The DCR-DVD100 has below average still capacity. The camcorder is a pretty cool gadget, novelty aside, it's a handy gadget too. Sure, you've got plenty of control, but the processor generally achieves adequate image quality, and with difficult to manipulate dials this unit is primarily point and shoot. While it is always difficult to anticipate the needs of this group, the DCR-DVD100 may be a few resolution levels away from performance in a professional environment. Area Weight Raw Adj. Poss. The DCR-DVD100 is a decent point and shoot camcorder with a smallish CCD and poor digital camera capabilities. While the camcorder has manual control features, they have inconvenient placement. The 10x Carl Zeiss zoom captures a quality image but at low resolution MPEG-2. At that resolution the camcorder does well in sun light, and even performs decently in low light. If Sony gets their processor power in gear, and redesigns the boxy un-weighted unit, they'll be contender on DVD.